We’ll start off with a little bit of FOOTBALL! 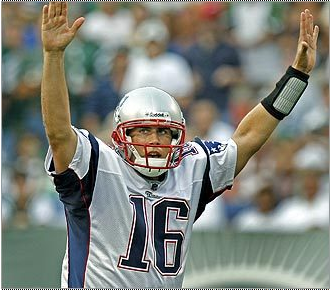 Matt Cassel started his first game today for the Patriots, and while it wasn’t stellar in the beginning, I see some definate potential there. Cassel notched his first win as a starter, and was the first (of six) to start his first game against the Farve and win it. Defense looked good, though that secondary is still a little worrisome. They looked pretty good going against someone like Farve, who has the potential to smoke them every time. Wes Welker had an amazing night (too bad he was on my fantasy opponent’s team) and it was a good showing for the Patriots, who look to still take the AFC East, even without their franchise man Tom Brady. Hence the title. With a Sox win against Doc Halladay (masterfully out-dueled by Lester) and a Rays loss to the Yankees, we are back within 1 of the AL East and heading to face the East leaders themselves at home. I think its only fair, having beat us two games at home, that we go back and sweep them at home (note, this is doubtful due to the fact that Kazmir is starting tonight). That’s all the campaigning I have for now. I’ll leave you with the video “Bop to the Top” just to get you in a cheerful mood before the Sox take on Kazmir and the Rays at the Trop.